Umi Baizurah gained her diploma in art education from the Faculty of Fine Art and Design at Universitas Teknologi Shah Alam (Technology University of Shah Alam), Malaysia. In 2000, she finished her BA degree at Universitas Teknologi MARA, Malaysia. She has participated in several exhibitions in Malaysia, Korea, Japan, and Pakistan. 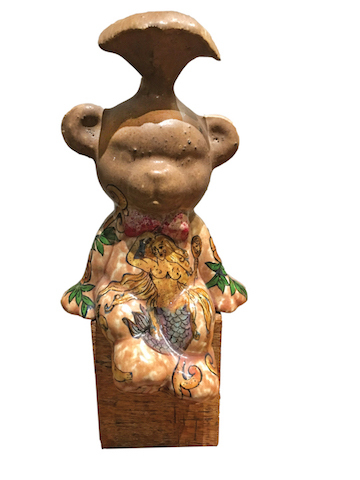 Umi’s artwork shows a figure that looks like a metamorphosis of a teddy bear with a mermaid body and tail that extends from the bear’s head. Umi’s artworks seem to present a paradox. She paints her figures in various bright and cheerful colours, evident in this piece of work. It seems like Umi tries to remind us of issues on individual identity in the community with all attributes that create the identity. In some cases, this can be very artificial. She tries to talk about the frauds that usually shape someone’s identity. She presents the ambiguity and paradox of the reality in life, and also, about the layered reality creating experiences in a human’s life.